Bacon is very easy to make. In its simplest form, it’s just the application of salt to pork, with some waiting around involved. My bacon isn’t much more complicated than this, and is based on the method from Hugh Fearnley-Whittingstall’s encyclopedic River Cottage Cookbook . Find a piece of pork belly, as big as you like, as long as it’s manageable and can fit into a big plastic box with a tight-fitting lid that will fit in the fridge without taking it over. 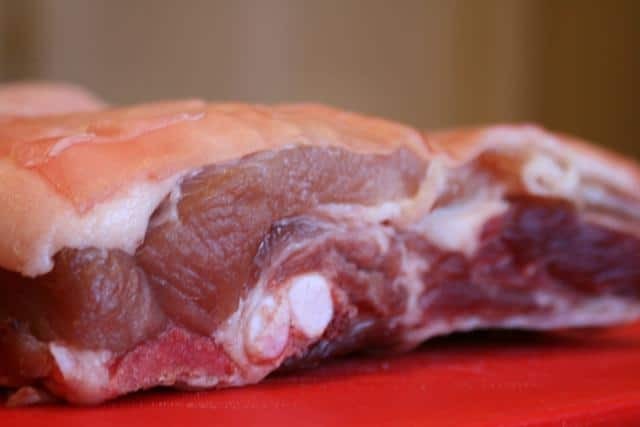 Your butcher will assume that you want to roast the meat, and will probably have scored the skin with a sharp knife, to make better crackling. This doesn’t matter. You can use any cut of pork to make bacon, but belly is cheap, easy to handle and makes streaky bacon, which I think is the best kind anyway. Next the cure. You can be adventurous here. My standard cure consists of salt (about 500g), soft brown sugar (about 150g) and lots of black pepper, with a small handful of crushed juniper berries. Mix everything together and rub handfuls of the cure into the pork belly. Place the meat in the plastic box, put the lid on and leave in the fridge. The next day, the meat will have leeched quite a lot of liquid, and will be sitting in an unpleasant brine. 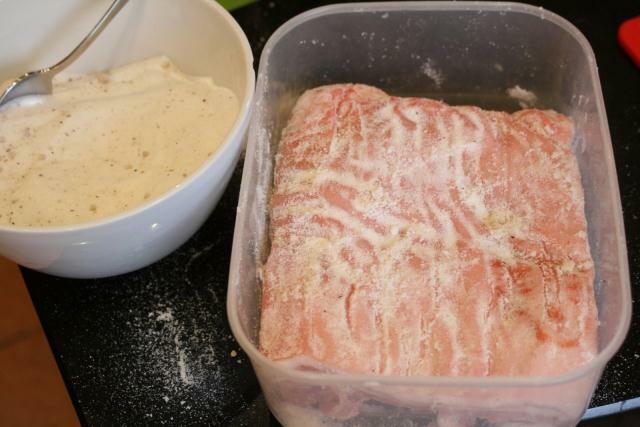 Drain the brine, rinse the box and rub fresh curing salt into the meat. Repeat this for five days, turning the meat over each day. After five days, rinse the bacon under a running tap and dry thoroughly. Wrap the bacon in muslin or a very clean tea towel, put it in a plastic bag and leave in the fridge until needed. The bacon will be fine in the fridge for weeks, but will freeze well if you’ve made a lot. This style of bacon tends to be quite salty, especially if you cure it for longer than five days. A seven-day cure will result in a bacon that is almost indestructible, but which will need a quick soak before use to make it palatable. It’s best used for recipes that call for lardons of bacon or pancetta – cut into thick slices and then diced and fried with onions, garlic, mushrooms and a little cream, it forms the basis of an excellent and quick pasta sauce. I ordered a pig from my butcher and have unseasoned bacon, already sliced and frozen. Can I apply this recipe/method to it? I have quite a bit and find it unpalatable without seasoning. Thanks!